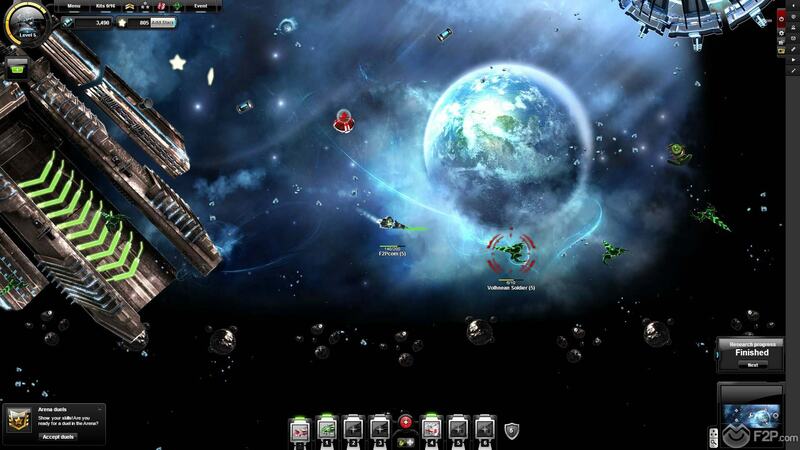 This week we decided to do a deeper play test of Nova Raider (check out our first look video). Currently in open Beta, the game is a space based isometric shooter that you can play for free in your web browser or through your iOS device as an App Store download. 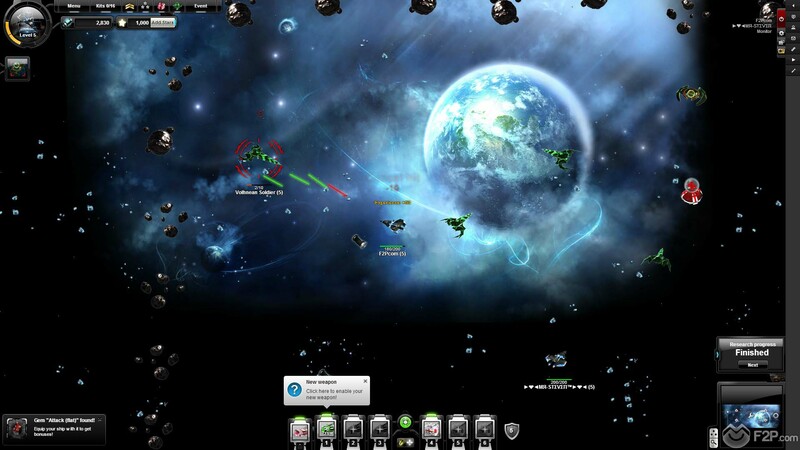 Stepping into the game for the first time we started out as a relatively new pilot in a Galaxy infested with monsters, enemy spaceships and of course rival players. The game revolves around a resource grabbing, currency acquiring, research developing sprint towards levelling up your character, unlocking different classes and going up against other players in endgame content through PVP. The game is actually simple, both in terms of mechanics and gameplay, suitable as a mobile app game it does feel like the browser integration is possibly secondary to this, or at least developed in such a way that they knew the app version was going to be a big thing for the company. 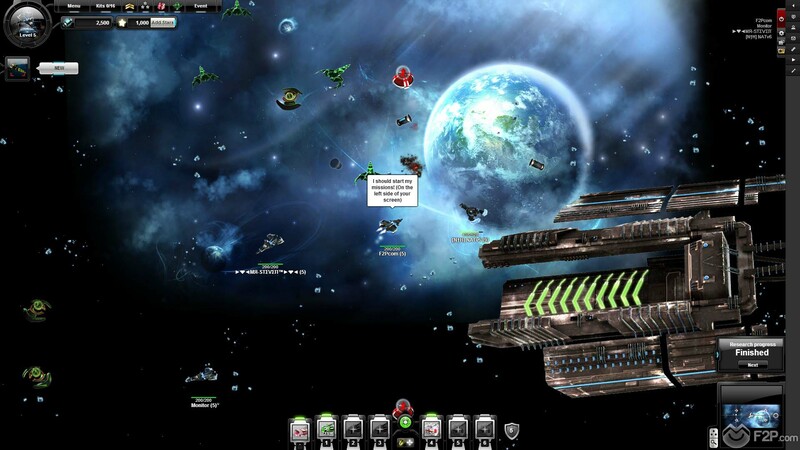 Unfortunately what this means is that the game is stripped back in terms of what type of complex mechanics we can realistically have, moving around the map consists of point-and-click or holding your mouse button (presumably keeping your finger on your mobile touchscreen) so that the ship you control continues to move. 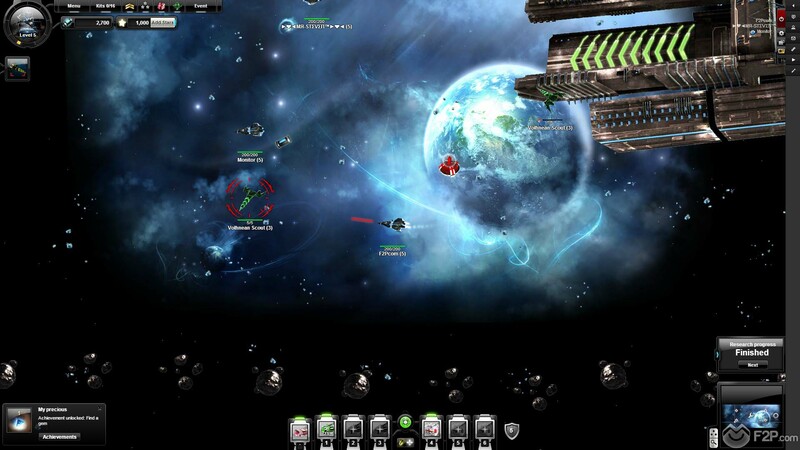 Attacking an enemy requires a single click and then you continue to automatically fire at them whilst you manoeuvre around, providing you stay within range; again all controls and mechanics that seem better suited for an app game but very basic for the types of browser MMO’s we’re accustomed to. The opening tutorial quests guided us through the basics of mechanics, and whilst we thought this would be short lived they continued even hours into the game with the quests simply guiding us to explore new features more in-depth or tasking us with missions that would take hours to complete such as acquiring a certain amount of XP from kills. With quests completed players earn larger amounts of Uranium, the main currency in the game, though it’s not necessarily worth pursuing quests outright for the financial reward but more for the XP that is acquired. Simply by killing enemies that are found everywhere (and constantly respawn as they only take a few shots to kill) each of them drops around 100 Uranium and so after a quick 10 kills you can already make as much currency through farming as you would completing quests. 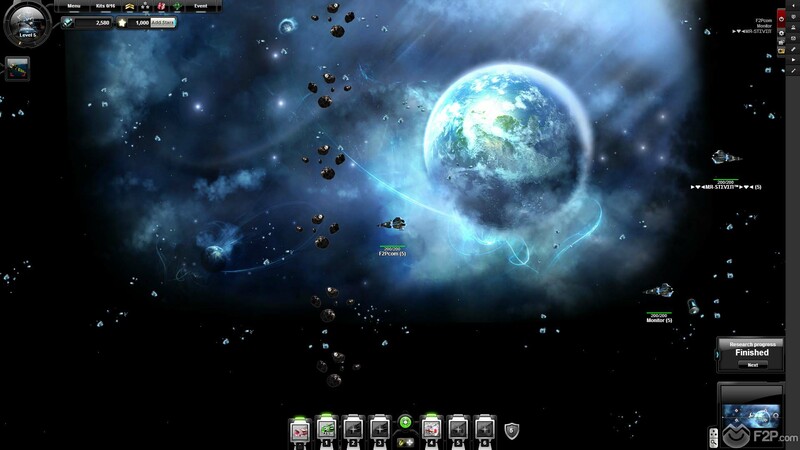 Uranium appears as a drop where ships are destroyed, other drops that can be found floating around the Galaxy are mineral resources that players can gather up and trade at the Market for more Uranium. Our biggest issue with the game is having to click the drops when they appear; this might seem like a little thing but picking up drops automatically by simply flying past them within a certain range would make collecting resources considerably less tedious (it really got to the point for us where we just stopped picking minerals up altogether). 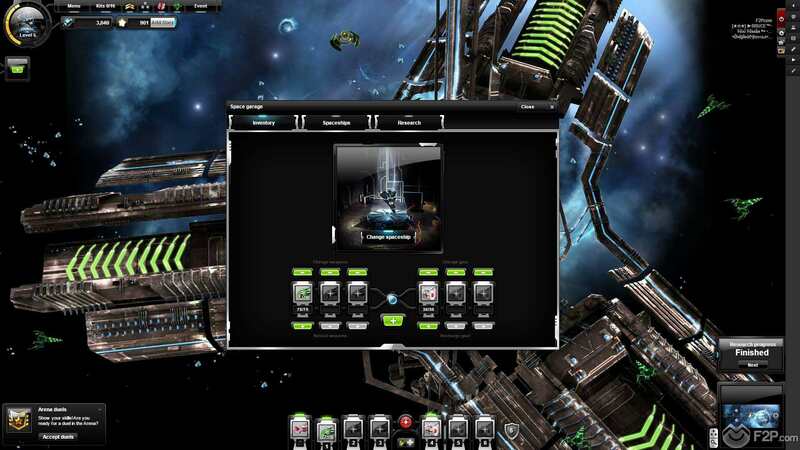 The game focuses around gathering Uranium which is required to purchase your new ship, players are able to switch between four different classes of ships with dozens of individual ships available for each class. For us we focused on a Tank class, which we acquired when we reached level 8, the jump up in hit points made a huge difference and allowed us to farm enemies considerably quicker. 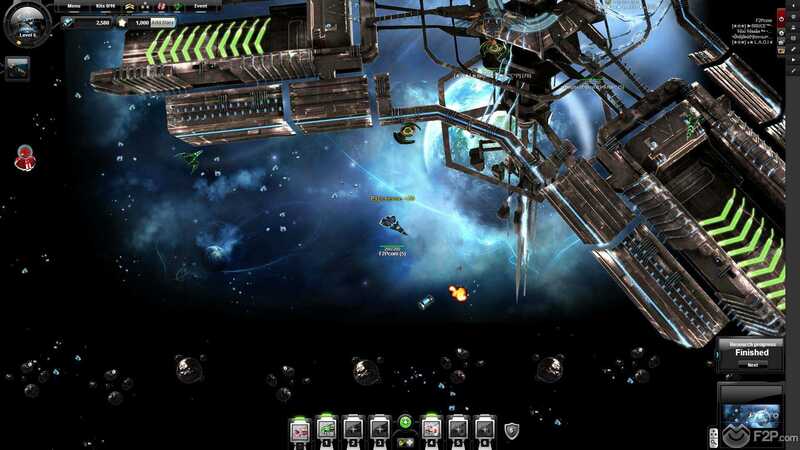 With cash in hand we are also able to research new technologies that give us access to a variety of upgrades and new weapons to customise our ship with, though you also need to spend Uranium to actually purchase these items as well as constantly paying for ammo reloads and keeping your health kits in supply. As fast as you make money in the game you use it just as quick, but it is the ease with which it is acquired through farming that kind of puts us off a little bit, you are in many ways encouraged and even forced to have to farm endless amounts of mobs to gain XP and Uranium in order to progress. Everything in the game is level locked, from features, the ships you acquire, ship components and even research which you can’t increase to a level beyond that of your own character/account, even different areas where you can use wormholes to transport between them are locked which means you spend a lot of time in the same area. Whilst the graphics do their job and the game doesn’t look bad, there’s not enough going on to make looking at the same backdrop for hours particularly entertaining. Every so often we get a change of pace by getting actual PVE missions, when triggered you are prompted to invite friends into a group if possible, which will also grant you more XP upon completion (rewarding players to encourage their friends to play). The missions are a nice change of pace, ranging from a base defence as enemies spawn for 10 minutes and we had to fight them off, a nice idea but unfortunately the base was low on total hit points and so the number of enemies that were spawning was pretty low and it wasn’t all that much of a challenge. 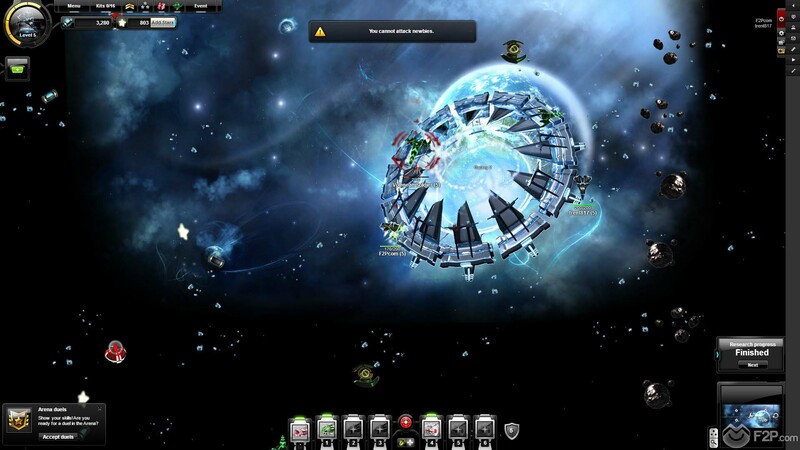 Other more unique missions involved trying to feed space spiders to a space worm type creature, the worm travel the perimeter of the map and as players by shooting the spiders they would move away from us so we could wrangle them towards the worm which would then destroy them. It was different, but it was still essentially the same gameplay. We did try out PVP, both World PvP and queueing for the PVP instances which unfortunately never triggered and instead always threw us into a battle against a bot, it consisted of us meeting the bot in the middle of the map and exchanging fire until we killed it with absolutely no tactics whatsoever. World PVP is slightly different, players cannot be attacked by anyone that is above their rank/level unless they attack them first, at which point the player assumes a new temporary PVP rank/level equal to the person that they attacked (this is removed once you are destroyed). At one stage we were attacked by a player of the same level and so we returned fire, dancing around for a while (though moving doesn’t really give you any benefit) until we started to get him low on energy at which point he headed directly to one of the public healing satellites which he sat on and just kept himself healed. In all honesty the fact that players can utilise the healing satellites whilst in PVP is kind of pointless as the moment you are on the losing end it’s not too difficult to seek one of them out given that they are highlighted on the map. Overall the game is relatively fun for a casual MMO, for a mobile app then its kind of mindless enough to be enjoyable, but in terms of being a browser game there are far better ones out there that we would sooner spend our time on unfortunately for Nova Raider. Being trapped in the same zone for hours and grinding on the same mobs gets pretty tedious after a while and it just wasn’t our cup of tea. One Comment - "Nova Raider Review"
Great review and true. The moderation team basically took over this game. Developers gave up. Account stealing is OK here as long as you pay a lot of money on it.